Reviewing Ubuntu GNOME 15.10, the most impressive release since Ubuntu made the switch to Unity. I reviewed Ubuntu 15.10 (along with openSUSE Leap 42.1 and Fedora 23) a little over a week ago. And, you know what? It is really solid. I'd go so far as to say it is the most excellent release of Ubuntu since they made the switch to the Unity desktop environment many years back. But… that's a bit of a problem. Since Ubuntu is so laser-sight focused on their in-house developed Unity environment, other environments simply don't work as well. I experienced multiple problems trying to run GNOME on vanilla Ubuntu 15.10 – and had similar issues with KDE Plasma. This, right there, stops me from recommending Ubuntu to anyone who isn't madly in love with Unity. Which I am absolutely not. But there are multiple off-shoots of Ubuntu focused on various desktop environments – including GNOME, KDE, and Mate. So it seems unfair of me to lump every Ubuntu flavor into the same "Vanilla Ubuntu Bucket." Thus I wiped Ubuntu 15.10 off my testing machine and installed Ubuntu GNOME 15.10. Let me cut right to the chase: This is what Ubuntu should be. This is an absolutely fantastic system that I could easily recommend to a wide range of people. The system, overall, feels snappier. (Pun intended.) I didn't do any specific benchmarks – and I don't have detailed memory or CPU usage information to compare the flavors (because I just didn't think of it when I was reviewing vanilla 15.10) – but the environment simply feels faster and more responsive. 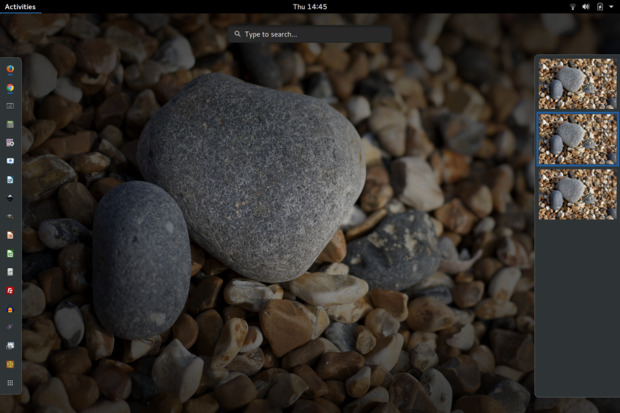 Hitting the super-key, for example, responds noticeably quicker in Ubuntu GNOME than Ubuntu. Bugs that I experienced in vanilla Ubuntu are… gone. In the days that I have been using Ubuntu GNOME I have not experienced one single problem. No multiple error messages after logging in. No failure to fully boot. It feels solid and dependable. Ubuntu GNOME is what Ubuntu should be. It's good looking. It's logically laid out and easy to use. And fast. This is the spiritual successor to what Ubuntu was in "the good old days." Some of the best, most polished Free and Open Source software packaged together in a way that is approachable and enjoyable for a broad range of people – including those new to Linux. The arguments about Canonical and Ubuntu opting to not work with the GNOME project and, instead, go their own way by developing Unity... is an argument we've had plenty of times before. That horse was beaten and left for dead years ago. So I'm not going to start it back up again here. Canonical… you screwed up with Unity. This, Ubuntu GNOME, is where you should have been (could have been) years ago. It is most triumphant.